On a cloudy but humid tropical day, several dozen sailors, donning crisp uniforms, gathered on aircraft carrier Carl Vinson’s port side elevator No. 4 as the ship maneuvered in the waters of the Pacific Ocean near Hawaii. On a table covered with a blue cloth sat urns of different sizes and colors – 43 in all – carrying the cremains of former service members and military spouses. The honor platoon and rifle platoon lined up for the burial-at-sea ceremony on Dec. 27. With calm winds and flat seas, a trio of chaplains with the ship and Carrier Strike Group 1 led the ceremony, which included remarks by the carrier’s skipper, Capt. Bruce Lindsey. One at a time, each of the cremains was placed on a blue chute, committing the dead to their final resting place in the sea. 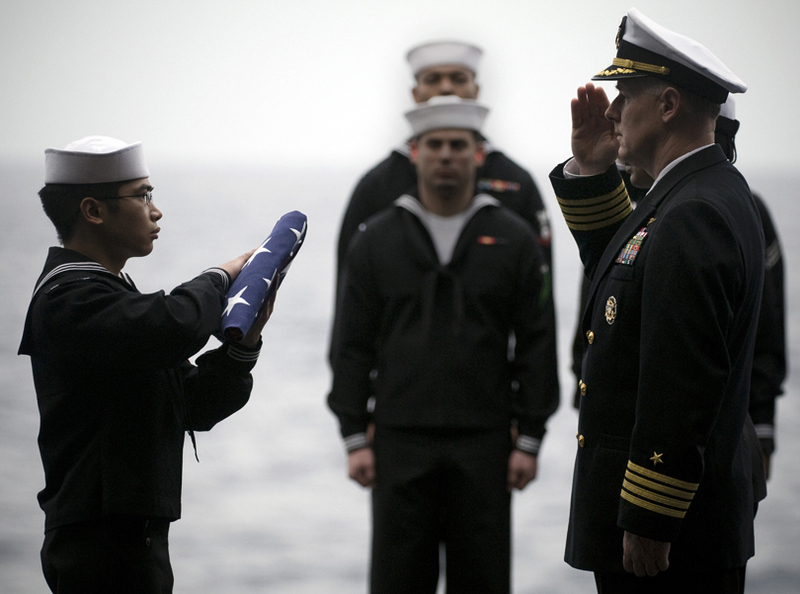 Among those buried that day – it was the ship’s largest burial ceremony – was one of the Carl Vinson’s first command master chiefs. The burial-at-sea is perhaps one of the Navy’s oldest ceremonies, an ancient tradition of sea-going sailors. It remains a benefit for former sailors and other service members, as well as their family members, and many ships and even submarines routinely perform the rite when at sea. Burial ceremonies are almost routine business on big-deck ships like Carl Vinson. “We’ve actually done a lot, probably more than any other carrier,” said Lt. Cmdr. Erik Reynolds, the ship’s public affairs officer. The public affairs office captured the ceremony in video and photographs, which with the chaplains’ help send personalized packages to each of the families. “We think it’s important, so we put a fair amount of effort and respect that goes into it,” Reynolds said. Reynolds himself is familiar with the ceremony. On his first ship deployment aboard the cruiser Princeton, he brought along the cremains of his grandfather, an Army veteran of World War II. “I kept his remains in my stateroom for about a month” before the ceremony, a bit unnerving to his roommates, he recalled. Iwant to know how do I go about requesting that I be having a buriel at sea when my time comes? I have no living relatives and this is what want to buried with my shipmates of the past.